I hadn’t been expecting to buy a computer this month. I certainly hadn’t been expecting to buy two computers this month. I bought the first computer in a panic, rushing under the crunch of the storm. I was working with a sales person who’s name was Lewis. I told him what I needed out of a computer, which, admittedly is quite a bit since I run my entire business from it. He told me the one that would be the best fit. He told me the price. I felt the rising tide of panic in my stomach. I couldn’t possibly spend that much on myself. There has to be another way. Maybe I should just fix the broken computer, surely an exploding battery and protruding trackpad aren’t that bad. Maybe I should just use C’s computer when she’s not looking. That sinking feeling of taking too much space. Of asking for too much. On the one side there is affording it, but where I really get caught up isn’t in affording it – it is in believing that I deserve to have whatever it is. The thing about this story is that it concerns a big ticket, luxury item, but I experience these feelings almost equally when considering a $10 purchase. It is not about the money. 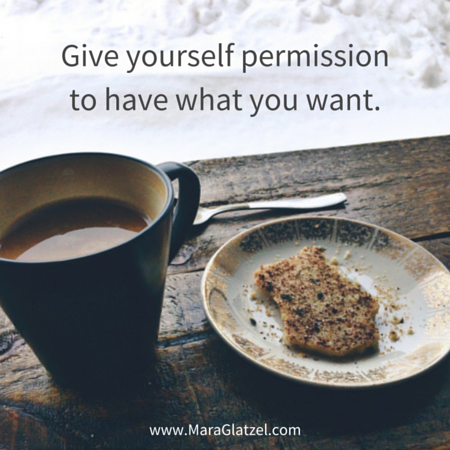 It is about allowing myself to have the things that I want. A note: I struck out “need” there and replaced it with want. Because, when we tell ourselves we can only have something if we truly need it… it leaves out the whole slew of things that we want just because they light us up – experiences, people, things. I didn’t not “need” a brand new computer. I wanted it. It is important for me to claim that. Lewis kindly directed me over to another computer, a replica of my old one, and told me that this computer would do everything that my old computer did and it was in my price range because they were phasing it out. It would be a little slower. At some point they might not be making software for it. But, for the next couple of years, it would be a pretty good fit. We drove home (in a blizzard). When I got home, I didn’t want to take it out of the box. I didn’t want to set it up. I left it in the corner, picking up my old computer and engaging in the fragile dance of using the lower right hand portion that wasn’t jutting up at an odd angle. Here’s my truth: I ignored my intuition in the moment of buying that computer. Instead of allowing myself to stand in my truth and power, I curled up in the safety of the low cost, even when I knew that the dreams that I have for this business and for this work would have been better served by the more expensive computer. I couldn’t allow myself to have it. I told myself the old story, we just don’t have money for things like that. The story that I had been telling myself since childhood. I said no when I desperately wanted to say yes. I had abandoned myself in the process. Wanting to be good, wanting to do it correctly, wanting to belong to my family of origin. I told myself that if I let myself have what I really wanted, I would become some sort of outsider. So, I sat down and ordered a second computer to replace the one in the box I wouldn’t open. I bought the second computer sitting on my couch with my excitement and reservations. I bought the second computer while telling myself that there was enough room for all of myself in my own life. That is the computer that I am writing to you from today. Here’s the interesting piece. I feel nauseous even thinking about telling you this story. What will they think of me? How totally obnoxious and elitist that I ordered not one but two computers. Ugh. This whole thing is disgusting. It’s true. My privilege is showing in this piece. I own that. But, I wanted to share this story because this is a process that so many of us encounter daily in different ways. We twist ourselves into knots about giving ourselves the things that we require – the things that we know that we need to do the work that we are here to do. We deny ourselves proper self-care, nutrition, and time. We refuse to invest even our own energy into our bigness. We say no to ourselves more often than we say yes. In the process we are starving our own inner lights instead of stoking the fires of our spirits. And why? So that someone, somewhere will think that we are good? So that we can belong? So that we can make other people comfortable by keeping ourselves small? Because we believe that it is virtuous to say no? The truth is that my spirit doesn’t require a fancy new laptop. My spirit doesn’t care a thing about laptops. But, my spirit is here for this work. My spirit shines brightly, vibrating excited energy through my skin when I use this tool to show up in this space, creating tools and courses that are healing for women. My spirit is here for this work – and this work is served by this laptop. My spirit shows up in the exact moment when I start saying yes to myself instead of no. Yes, you may take this hour to create something beautiful. Yes, you can have that. You can have this life that you have created. You can receive the abundance that you tenderly cultivated.